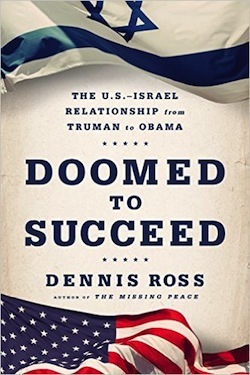 Ambassador Dennis Ross was in Winnipeg earlier this month to promote his latest book, Doomed to Succeed: The U.S.-Israel Relationship from Truman to Obama (Farrar, Straus and Giroux). He was one of the participants in the city’s Tarbut Festival. Ross is the William Davidson Distinguished Fellow at the Washington Institute for Near East Policy, as well as a Distinguished Professor in the Practice of Diplomacy at Georgetown. He has been very involved in American peace efforts in the Middle East, especially during the administrations of presidents George H.W. Bush and Bill Clinton. Among other accomplishments, he helped Israel and the Palestinians reach an interim agreement in 1995, helped broker the Hebron Accord in 1997 and facilitated the 1994 Israel-Jordan peace treaty. In his new book, Ross explores the attitudes and approaches of every U.S. president toward Israel, and the Middle East in general. He highlights some of the lessons that could have been learned from leader to leader, but were not, and how American presidents have shaped their country’s policies toward Israel. Ross then discussed the spate of terrorist stabbings that has been occurring in Israel, referring to this as “a new normal” that we will need to get used to for the next while. According to Ross, every administration, from Harry Truman to Barack Obama, has had people in the back office advising their president against siding with Israel. As such, to varying degrees, every president has considered Israel a problem, and not a partner. “This mindset that tends to look at Palestinians and Arabs as something we have to be careful around … if we are going to be criticizing them, it will create a backlash against us … this is a mindset that has existed in every administration,” Ross said. In his book, Ross conveys that the only American president who did not listen to these back-office advisors was Clinton, who saw the United States as Israel’s only friend. Jumping from one president to the next, Ross provided glimpses of the eras and issues covered in his book. For example, Ross said, Ronald Reagan was “the only one to suspend [the supply of] F-16s to Israel as a punishment … because the Israelis bombed a [nuclear] reactor in Iraq. Reagan later acknowledges that it wasn’t a bad thing,” meaning Israel’s actions. Ross provided supporting evidence for each of these assumptions. “I’ll give you some examples from the book,” he said. “The most outrageous example was [Richard] Nixon. In March of 1970, Nixon decides to suspend F4 Phantoms to Israel. Now, I said that Reagan suspended F16s as a punishment. Nixon doesn’t do it as punishment. He’s trying to reach out to [Egyptian president Gamal Abdel] Nasser. He thinks if he suspends arms to Israel, he’ll gain with the Egyptians, gain with Nasser. What makes this an outrageous example is that he did it at the very moment that the Soviet Union was sending military personnel to Egypt.” While Nixon expected to be rewarded by Nasser, Nasser instead demanded more. About the title of his book, Ross said, “Fundamentally, we [America] and Israel share interests and threats. That has always been true. It’s especially true now, as you look over the next 10 to 20 years, the struggle with ISIS and also Iran. We have two proxy wars. Who will dominate the region? The fighting is over identity. You fall back on the fundamental instincts. The talk concluded with a few questions from the audience. Ross was asked about the Iranian nuclear deal and how he felt about it. Ross said he felt the deal needed tweaking to ensure a positive outcome. “I wanted a firewall now if we see them moving toward a weapon. If we don’t do that, I can’t support it. I wanted us to make our declaratory policy much blunter, to make it clear they can’t use enriched uranium after 15 years. I wanted us to spell out now what happens if there are violations along the margins. For every transgression, there’s a price. They don’t escape. I wanted us to target new sanctions.